Beautifully decorated two BR, two bath home (newly remodeled in 2018) centrally located at Quail Creek (a gated Robson master-planned retirement community)in Green Valley, Arizona. The exterior of the house is stucco with a tiled roof. The house has ceramic/porcelain tiled floors throughout. Ceiling fans are located in the living room, bedrooms and outdoor patio area. The patio area also has an outdoor table & chairs, gas BBQ grill, and a gas KIVA fireplace. The back yard is completely fenced in with block & wrought iron railings. The house is centrally located within Quail Creek and is close to the club house, fitness center, pools, hot tub, lighted bocce, pickle ball and tennis courts and a 27 hole golf course. Sidewalks throughout the community provide for a very safe walking environment for enjoyment of views of the surrounding mountains and desert landscape. There is also a restaurant (Quail Creek Grille) on-site which serves excellent food (breakfast, lunch & dinner). Renters are provided short term membership cards to enable them to enjoy the use of all the amenities provided to Quail Creek homeowners. Centrally located within the Quail Creek community. Easy walking distance to the pools and clubhouse. New additions to the home include granite counter tops in the kitchen, ceramic and porcelain tile floor throughout, golf cart, golf cart garage, and a block and wrought iron wall which surrounds the entire back yard. Solatube skylights in each bathroom brightens the interior with natural Arizona sunshine. 27 hole golf course, club house, fitness center, lap pool, large swimming pool, lighted bocce ball courts, lighted tennis courts. lighted pickle ball courts, restaurant, crafts & technology center. Available at the Quail Creek Library. billiards and ping pong table available in the Quail Creek club house. 2 ceiling fan lights, patio table & 4 chairs on back porch of house. The back yard is fenced in with brick columns and wrought iron railings. 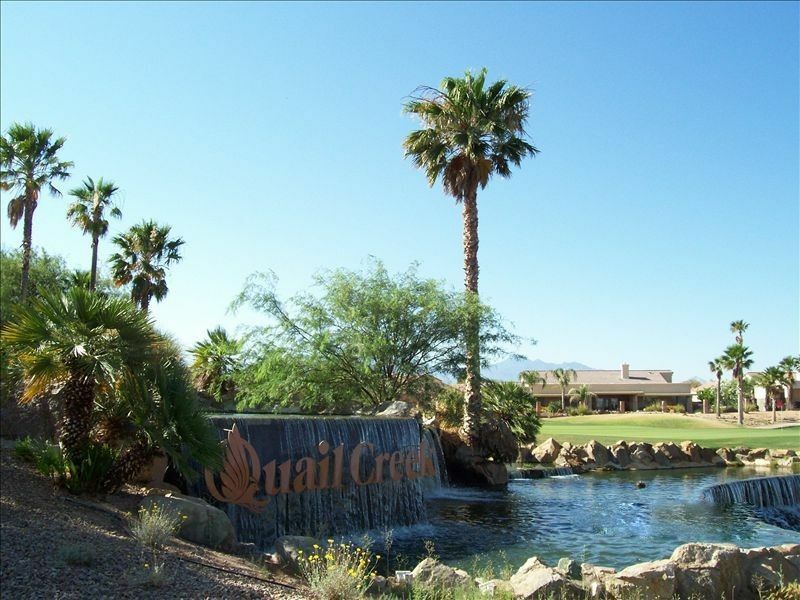 Lighted tennis courts, bocce ball courts and pickle ball courts are some of the Quail Creek Community amenities. 27 hole golf course is part of the Quail Creek community amenities. A golf cart is available at the house for our guests use. Two large outdoor pools. One for general swimming and one for lap swimming. Terry the owner arranged for his property manager to get us in. House was in great shape and fully stocked. Pictures accurately reflect the home. Enjoyed our return to Quail Creek. We would be very glad to rent this home again. Our 4 month stay at this property was truly a comfortable and satisfying stay. The house was fully equipped with all of the amenities you would have at home. The pictures accurately reflected the house and patio. The owners, Terry and Louise, were always available to answer questions and we would definitely rent this property or one of their others for a winter vacation. This is a resort style 55+ Active Adult Community. Residents and guests of this community must be at least 55 years old to stay to reside in the community. Various club activities, table tennis, and billiards are available in addition to the amenities mentioned above. There is a golf cart available for use at the house ($150 per rental) No pets permitted. Electric Usage in excess of $100 per month will be an additional fee and offset against security deposit.